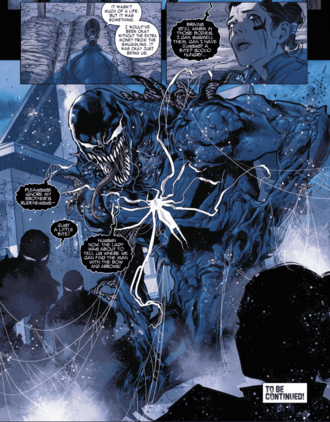 Ethan Sacks gives a behind-the-scenes look at the issue! In our Creator Commentary series, we give the floor to our storytellers as they present behind-the-scenes looks at the decisions that go into every last panel and page—in their very own words. 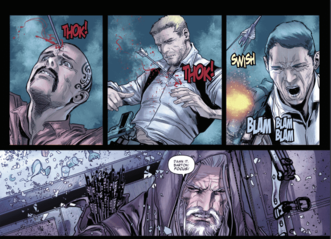 Today we prepare for this week’s release of OLD MAN HAWKEYE #3 by taking a closer look at issue #2 with writer Ethan Sacks. Read up on our coverage of issue #1, then dive into #2 below. 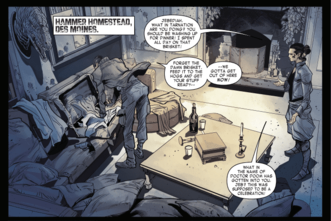 In issue #2, Jebediah Hammer, a descendant of Justin Hammer, (and the merchant that was with Hawkeye when the Madrox gang first attacked) is frantically packing because he knows there will be consequences after the events of last issue. So he’s trying to get his family out of there. His wife thinks he’s totally overreacting but of course he’s not, spoiler alert, because on page 2, my favorite page so far in the series that Marco is an absolute wizard at, we see that Bullseye’s found them. What I wanted to do for this scene is capture the vibe of “Inglorious Basterds,” the very opening with Christoph Waltz, where he plays this Nazi and he’s in this farmhouse and it’s this really tense scene because on the surface it’s just a conversation but you know it’s going to end badly at some point—you just don’t know when. So I was trying to sort of capture that vibe a little bit. I really like how the scene came out, not patting myself on the back or whatever, but between the art and the conversation I think it’s pretty cool. 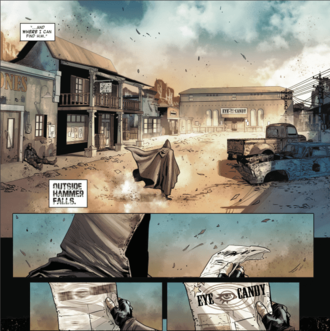 But meanwhile, we have Hawkeye who’s started his quest and the first thing he does is search for one of the Wastelands purveyors of information. So who sees everything? A guy with a giant eyeball for his head. I just love the visual for the Orb. So he goes and of course the Orb would have a club called Eye Candy—an exotic dancer joint. Apart from the mob drama scene, I also wanted to show one of the most heartbreaking things about this world is how these heroes are totally debased and how generations are going to grow up not knowing what a hero is. I thought the idea that these people would be watching women and men scantily clad as heroes and sort of the voyeuristic thing of that would be heartbreaking so there was a little bit of a visual I was hoping to get here. From page 5, I just want to say every day should be colorist appreciation day and I want to give a shout-out to Andres Mossa. 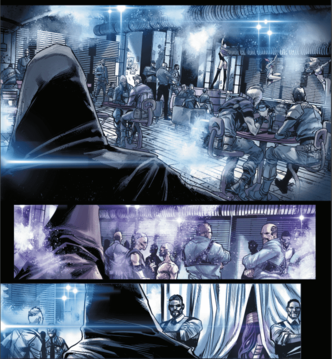 So what he did here is, you look at this club and if you notice every panel is alternating with shades of blue and shades of purple because of the strobe effect of the lights of the pulsing dance vibe. 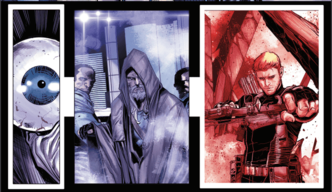 So that is just an example of how you may not notice it the first time you see it but that is a skilled colorist right there, basically makes the story better. 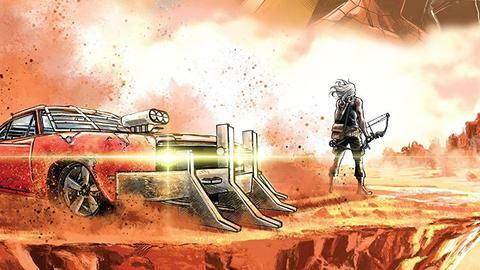 Related to the color, you’ll see the flashbacks have this fiery red, it looks like a hell, so that’s just the mark of a great colorist, bringing you in and out of different locales with the palette. 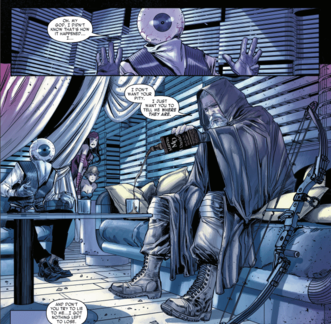 We see a couple pages later, Bullseye has this computer interface which gives an advantage to him, so you’ll see that through the book a little bit. One little subplot (that’s a very small subplot in this issue), with Jebediah Hammer and his wife Susannah, there’s actually kind of a love story. They clearly love each other because when, spoiler alert, Jebediah Hammer basically has his artery cut by a playing card and he’s dying, his last act is drawing out a clue in his own blood because basically he’s warned by Bullseye, “You better come through before you die or I’m going to kill your wife.” So he saves her and she, spoiler alert, lives no matter what the last page seems to indicate. I just wanted a little bit of love in this horrible, horrible existence to actually mean something. You’ll notice too that Hawkeye is starting to miss more frequently. Throughout the book we’re going to see the consequences of his diminishing eyesight, so during the big action scene in this book, which Marco rendered amazingly, we’ll start to see some more of that. The most damning two-page spread is a flashback scene. We parse out a little bit about the horrible event, 45 years ago, that’s driving Hawkeye now. 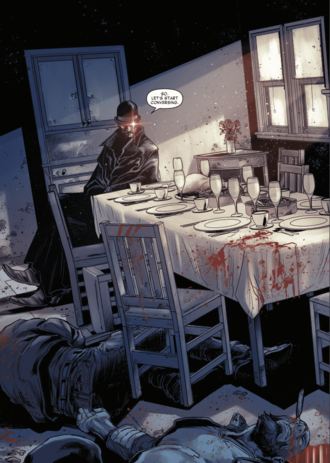 We know from a line in “Old Man Logan” that he kind of was upset that he was left alive. 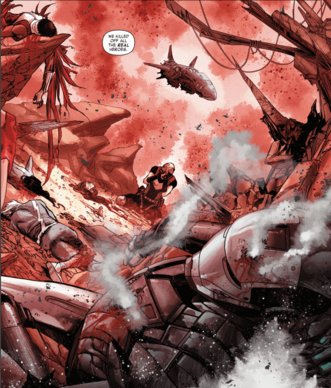 We kind of wanted to show that, so we get to see a lot of dead Avengers. I felt a little bit like a serial killer, just choosing who would be on this page and how they died and why they were included in this team. But the thought that I had was that there would be several Avengers teams, all of a sudden imagine you’re getting an alert that all these super villains are attacking out of nowhere so they send teams to various locations—and Hawkeye was in charge of one of them. Captain Marvel would have been in charge of one of them, Black Panther would have been in charge of one of them, Captain American, certainly—and we know from “Old Man Logan” how he died and where he died. So this was a team that was sent to Las Vegas, and we know it’s Las Vegas because Thor’s hammer is there, and the city is now called Hammer Falls. So we’re telegraphing stuff that we will learn later in more detail. I will say this, there is a clue on this page as to the identity of the people he’s hunting but you have to be really, really eagle-eyed to figure it out. Coming out of the flashback to the present, Hawkeye takes a swig of bourbon, and it’s Marcus Daniels…which is the name of a minor super villain called Blackout. You can keep an eye out, there are going to be little tweaks here and there or little visuals here and there that kind of allude to the super villains who weren’t so super that they earned monuments or anything. Speaking of which, when Bullseye has tracked Hawkeye’s trail to Tanya’s garage on page 17, panel 2, he confronts Clint’s daughter Ashley about his whereabouts, and she’s wearing an “Angar and the Screamers” t-shirt. 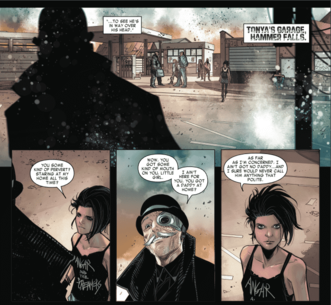 That’s another little Easter egg—kind of figured she’d be into punk and that sounded as punk a band as there would be in the Wastelands. I really like her character, and I wanted her to stand up to Bullseye and Bullseye to be impressed enough that he doesn’t kill her right where she stands. I like that exchange where she’s not intimidated at all by him. Possibly because she’s so young that she doesn’t know who he is, but she clearly doesn’t care one way or the other, so I like that about her. Then we have the second to last page, Hawkeye reaches the location where he’s going to have his first major fight next issue with one of the people he’s looking for. Especially because I have such a gifted art team working on this, I wanted to explore a new type of setting. What would an amusement park look like in this world? 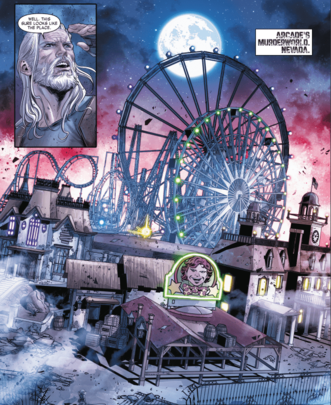 We’ll see more of it in next issue but of course it’s Arcade’s Murderworld because who else would have started a theme park? There’s another little clue as to who his first opponent is on the bottom of that page. Then finally, we see—this is the big cliff hanger in this issue on page 20—we see, as poor Susannah is burying her husband and kids and confessing her love for her family, she is disturbed by three Venoms. So basically what we find out is the Madroxs can of course keep replicating themselves, but also duplicate the symbiote, which is going to be a big headache for Hawkeye later in this series. So it’s Venoms—plural—and his troubles are just beginning. Continue the story by reading OLD MAN HAWKEYE #3, from Ethan Sacks and artist Marco Checchetto, on March 28!